It’s been a long week for folks at the U.S. Environmental Protection Agency — and a longer week for West Virginia coal miners. Our state’s mining communities were already hurting, and many folks spent part of their week on the road, since the EPA wouldn’t bother to come to the coalfields to hear what miners and their families had to say about the agency’s climate change rules. This week, West Virginia leaders were painting a picture of the rosy future that could await the coal industry, were it not for the Obama administration. Sprinkled among comments criticizing proposed reductions in greenhouse gas emissions, the state’s elected officials made it sound like the good times could be just around the corner for the coalfields — if only the U.S. Environmental Protection Agency would get out of the way. Speaking to a coal industry rally in Pittsburgh on Wednesday, Gov. 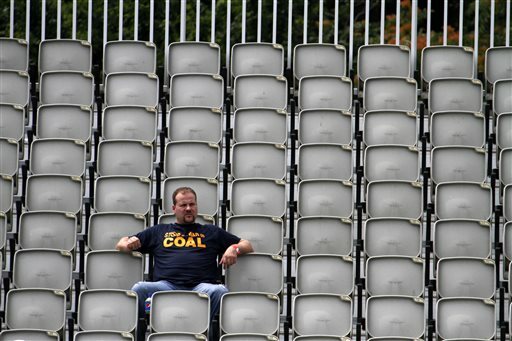 Earl Ray Tomblin cited projections he said showed “coal will be the world’s leading source of energy” in 2035. Testifying at an EPA public hearing in Washington, Sen. Joe Manchin, D-W.Va., noted that coal is expected to continue to provide at least 31 percent of U.S. power through 2030, and that coal use by other countries, primarily China and India, is growing. “Coal isn’t going away around the world,” Manchin told EPA officials. However, what Tomblin, Manchin and other coal industry supporters weren’t saying is that less and less of the coal that gets burned will come from the hills and hollows of Southern West Virginia. Experts agree that coal in the state’s southern counties remains in a long-term downward spiral, regardless of what the EPA does or doesn’t do about global warming. Coal production in the state’s southern counties, and the rest of the Central Appalachian basin, has plummeted in the past 15 years. Current government forecasts project a steep decline will continue through the end of this decade before bottoming out. While tougher air-pollution rules have played a role, experts cite a variety of more important factors, with competition from cheap natural gas and a long-predicted depletion of the best and easiest-to-reach coal reserves chief among them. Political leaders and coal industry officials can complain all they want about President Obama and the EPA, experts say, but even if they win that fight, it’s not going to stop the decline in Southern West Virginia’s coal industry. … However these actions also show the real-world impact of the regulatory environment in which industry must operate. Today’s announcement, in part related to power plant closures as a result of past EPA regulations, is why we remain concerned about the EPA’s current proposals regarding CO2. The announcement is further evidence of the toll that market forces, including the low cost and abundance of natural gas, have taken on coal jobs. But it is also incredibly frustrating to have an agency like the EPA being so purposefully blind to the effects of its policies on the economy and the lives of hard-working families. I stand firm with our coal miners and will continue, at every opportunity, to help advance legislation in the House to block job-killing regulations. I hope the Senate will follow suit. Governor Tomblin’s plan for the entire state is to grow jobs with a highly trained work force, world-class education system and competitive tax structure, and all of those initiatives will help southern West Virginia as well. At the same time, special outreach efforts such as job retraining assistance and Reconnecting McDowell are being used to provide additional assistance to the southern part of the state to ensure future generations have the resources and skills they need to succeed. The governor’s goal has been, and continues to be, improving the quality of life for all West Virginians. According to the Energy Information Agency, coal will be the world’s leading source of energy, surpassing oil by 2035. The power sector adjusts to a new life with wind and solar Renewables account for nearly half of the increase in global power generation to 2035, with variable sources – wind and solar photovoltaics – making up 45% of the expansion in renewables. China sees the biggest absolute increase in generation from renewable sources, more than the increase in the European Union, the United States and Japan combined. In some markets, the rising share of variable renewables creates challenges in the power sector, raising fundamental questions about current market design and its ability to ensure adequate investment and long-term reliability of supply. The increase in generation from renewables takes its share in the global power mix above 30%, drawing ahead of natural gas in the next few years and all but reaching coal as the leading fuel for power generation in 2035. The current rate of construction of nuclear power plants has been slowed by reviews of safety regulations, but output from nuclear eventually increases by two-thirds, led by China, Korea, India and Russia. Widespread deployment of carbon capture and storage (CCS) technology would be a way to accelerate the anticipated decline in the CO2 emissions intensity of the power sector, but in our projections only around 1% of global fossil fuel-fired power plants are equipped with CCS by 2035. According to the International Energy Agency, coal will be the world’s leading source of energy, surpassing natural gas and renewable sources by 2035. … The time has come to have an open and honest dialogue about coal’s future in West Virginia. Denial, anger, bargaining and depression are the stages a human mind goes through in adapting to any loss, from misplaced car keys to death. Sometimes we move steadily from one to the next, and sometimes we go forward and back and experience the phases simultaneously. Our fear, anger and pain cause us to abandon logic and deny plain facts starting us in the fact. You can see it all in these reactions Mr. Ward has assembled here for us. The way of life, the economy, the culture and the society based on coal mining in this region is dying. Some day it will die. Many things will change. I don’t know how you will get many people to move into the final phase of acceptance. Ken, I agree the statement with its use of “surpassing” and “by” (rather than simply stating that the IEA expects coal to be the leading or a leading energy source in 2035). I think it is important to note that coal demand is expected to increase fairly substantially by 2035 — expanding 17% globally. So, in summary renewables are expected to grower faster from a smaller base, while coal is expected to grow more slowly from a larger base, and the growth is expected in developing countries with flat/declining use in the OECD countries. In my opinion, the important subtext/discussion is what coal basins will this coal be coming from, and that where CAP’s relative fate does not look good. In the USA, the PRB, Illinois, and N. Appalachia will likely all fare better than CAP unless there is a very strong resurgence in the met coal markets. Curious, the question should be for those who seem concerned about climate is this; What quality coal do we want developing countries burning? “Before the March 2011 Fukushima disaster, both Germany and Japan were nearly 30% nuclear-pow­ered. In the next four months, Germany restored, and sped up by a year, the nuclear phaseout schedule originally agreed with industry in 2001–02. With the concurrence of all political parties, 41% of Germany’s nuclear power capacity—eight units of 17, including five similar to those at Fukushima and seven from the 1970s—got promptly shut down, with the rest to follow during 2015–22. In 2010, those eight units produced 22.8% of Germany’s electricity. Yet a comprehensive package of seven other laws passed at the same time coordinated efficiency, renewable, and other initiatives to ensure reliable and low-carbon energy supplies throughout and long after the phaseout. The German nuclear shutdown, though executed decisively, built on a longstanding deliberative policy evolution consistent with the nuclear construction halts or operating phaseouts adopted in seven other nearby countries both before and after Fukushima. Moreover, the Energiewende term and concept began before 1980, and Germany’s formal shift to renewables—now well over 70 billion watts installed—began in 1991, 20 years before Fukushima, then was reinforced in 2000 by feed-in tariffs. Those aren’t a subsidy but a way for customers to buy, and hence developers to finance and build, the renewables society chose, with a reasonable chance for sellers to earn a fair return on their investments. FITs’ values have plummeted in step with renewable costs, so developers now commonly opt to earn higher market prices instead. “Contrary to widespread misreportage, closing those eight reactors did not cause more fossil fuel to be burned. Whenever renewable sources run in Germany, both law and econom­ics require them to displace costlier sources, so renewables always make fossil-fueled plants run less, though often in more complex patterns. The data confirm this: from 2010 through 2013, German nuclear output fell by 43.3 TWh, renewable output rose by 46.9 TWh, and the power sector burned almost exactly as much more coal and lignite as it burned less of the costlier gas and oil. German utilities bet against the energy transition and lost. Now they gripe that the renewables in which most of them long underinvested have made their thermal plants too costly to run. There is also reason to believe that EIA may be underestimating China’s development of renewable power. I don’t see any “hyperlinks” given by Howley or the curious. Why? The rest of what he quotes comes from the article you will find at that link. Are you referencing conventional pollutants or GHG? With regard to conventional pollutants, I think this might have more to do with the combustion/boiler technology being used than the innate coal quality. For GHG, I think you’d pay the most attention to the thermal efficiency. William, I went to your Forbes link. It’s dead. Nothing there.